People loves tablets, at the same time they want to communicate via smartphone. So, ASUS released its new Fonepad in the Philippines this June 21 to June 23, 2013 only. ASUS Fonepad give convenience, instead of carrying two gadgets ASUS Fonepad will function both, having a large display of 7 inch with full HD 1080p video decoding capability, run by Intel atom processor, and a weightless 340g weight, and guess what? The first 100 customers can get a chance to win a 32GB MicroSD and different ASUS freebies to participating customers. 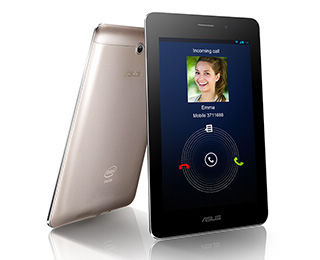 ASUS Fonepad has full metallic body and a 10.4mm thickness, so portability is not an issue. More ASUS Fonepad specification below. Prices are stated above in two variants of ASUS Fonepad. Available in SM Mall of Asia Activity Center this June 21 to June 23, 2013. If you happen to have this phone, kindly share your experience with us, so that other may find a tip or two. Thanks!